Increasing expenditure on healthcare services and technology has ensured a robust growth for the liquid handling systems market, as rising disposable income has allowed people access to new drugs, treatments and diagnostic solutions. Pharmaceutical and biotech companies have indeed expended substantial capital on research and development of new medicines. Rising number of clinical trials involving numerous chemicals and their testing has fueled the growth of the liquid handling systems industry. Continuous expansion of production facilities and collaborative efforts between pharmaceutical companies have generated tremendous revenues for businesses that provide medical equipment. More recently though, automation of manufacturing and laboratory processes is gaining traction worldwide and promises to conspicuously transform the liquid handling systems market. Indicating the significance of automated processes, industry experts claim that the pharmaceutical sector in countries like China will require automation to capture or maintain their position in the global markets. Mounting pressure to reduce costs of R&D as well as for eliminating human errors in clinical trials has brought the automatic liquid handling systems industry into focus. Companies in the U.S. and Europe have already adopted automation in their manufacturing facilities to provide improved performance and high quality drugs. However, with increasing prevalence of chronic and life threatening ailments, the need for early diagnosis of cancer and other infectious diseases has been widely comprehended, driving the progression of diagnostic centers. Diabetes and obesity, often related to each other, are becoming more prevalent in developed and emerging economies. Symptoms of diabetes can appear suddenly and most of the times require effective diagnostic solutions to check sugar levels in blood and determine the type of disease. Diabetes and prediabetes symptoms, many a times, are not evident and government organizations even provide suitable guidelines for the screening of the disorder. The liquid handling systems market will garner substantial benefits from the growing awareness regarding diabetes and the risk of obesity. As more people utilize the services of diagnostic centers and labs, automated instruments will help to reduce the time spent on repetitive tasks. Elaborating on the potential of diagnostic centers to bolster the liquid handling systems industry, almost 422 million people in the world had diabetes in 2014 and in 2016, about 1.6 million fatalities were attributed to the disease. It was also reported that nearly 84.1 million people aged 18 years or older in the U.S. had prediabetes, which represents a risk of developing type 2 diabetes. Experts can surmise that with the vast number of diabetes cases noticed across the globe, diagnostic labs will need to become more sophisticated over the coming years, giving fast and more accurate results. Automatic liquid handling systems market will be critical in helping centers speed up monotonous diagnostic activities involved in blood screening, DNA analysis, among other processes. Obesity has become a real concern for millions around the world as it not only indicates a probability of having diabetes but also other fatal chronic diseases. Obesity and overweight are associated with up to thirteen types of cancers, including stomach, bowel, oesophageal, liver, pancreas, gallbladder and kidney. Subsequently, diagnostic centers have witnessed increasing investments towards the early detection of these diseases and assist in developing treatment options. Statistics show that in the U.K., obesity and overweight is the second leading cause of cancers after smoking and almost 62% adults in the region are obese or overweight. Having enormous technical capabilities and funds, the region will contribute considerably towards the automatic liquid handling systems market. With consistent efforts to develop low-cost therapeutic alternatives for addressing the unmet needs of diabetes, cancer and heart disease patients, the importance of diagnostic centers will be further highlighted. The necessity of automated instruments suited for medium and high throughput applications and multiple liquid transfer needs will trump up the share of the automatic liquid handling systems industry in the global healthcare sector. 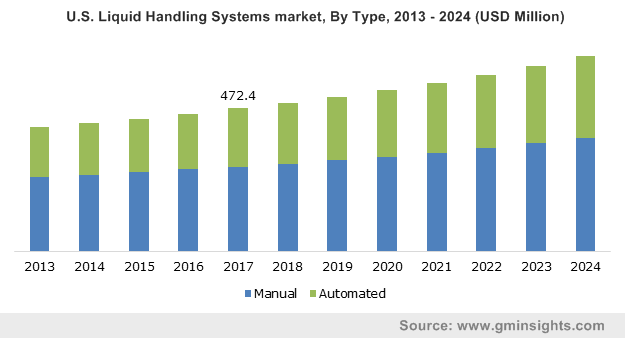 Key players constituting the competitive hierarchy of the worldwide liquid handling systems market include Eppendorf AG, Hamilton Co., Gilson Incorporated, Thermo Fisher Scientific, Inc. and Sartorius.